With not a lot happening on the vegetable front (save to report that my garlic varieties Prim, Colorado Black and Uzbek Turban, have all come up) we were able to get some gardening done at the Friary in the run up to Christmas. On a bitterly cold morning we kept warm by spreading 400 litres of bark mulch, having weeded first, though you'll see we weren't so careful in removing all the leaf debris.....time...time....if only we had more. Starting on the eastern-most side of the border we'll work our way along it in thirds. If we get down there on both days this weekend we should be finished by Christmas. 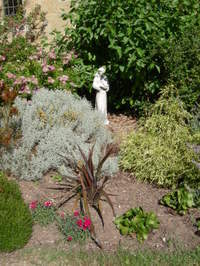 The new planting is beginning to establish despite the rabbits; the bay tree to the left was already there and is hitting its stride; the other bay and the magnolia are coming on but the existing roses (Peace) are struggling. 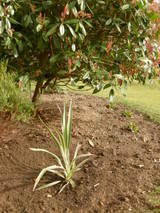 A case of wrong plant, wrong place and nobody with enough time to mulch, manure and prune them properly. 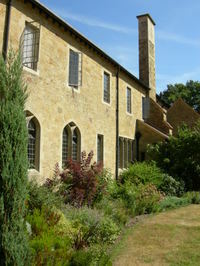 Now that the Friary is home to several postulants (wannabe Friars) we'll try and enlist them as upaid muscle. Nothing like a bit of hard labour to help discern your intention and commitment to living in community. That'll sort the men from the boys (eh...isn't that the problem I hear some say). 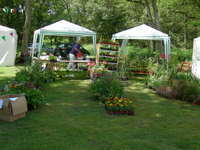 A great day last Sunday at the Friary Fete with the plant stall taking £427/$840. The weather held, the grounds were jam packed and maybe we'll top last years proceeds of £10,000/$19,700 for the day. - don't underprice, you're not a nursery but just because you're a charity people shouldn't (but often do) expect you to be cheap. 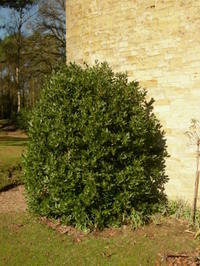 - where plants are donated you can afford to offer a deal. We'd some geraniums donated by a Chelsea Flower Show designer and these sold quickly at a fair price; people loved the provenance. - everything in flower will sell, buyers want immediate impact, something to go by the front door or on the patio and in one case to decorate a grave. Pack the stall with marigolds, geranium, lavendar, anything with colour and in bloom. - tomato plants sold out, we didn't have had enough courgette (zucchini) plants, people wanted basil and we had none, the fancy mints took ages to shift with everyone wanting a bog standard spearmint and we were left with what seemed like a prairie load of grasses. I'm not a Festuca fan anyway - no bloom, no stall appeal! - don't want to carry anything home? 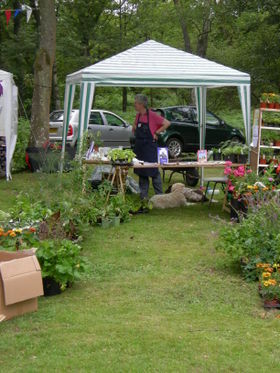 Get the PA to announce, half an hour to go, that the plant stall is open to any reasonable offers; stand back and wait for the rush. This Ceanothus (it may be 'Cambridge Blue') is flowering well in the Friary garden and once it's over we'll trim it back fairly hard to keep its tight dome shape. It gives a nice splash of colour and we are trying to think what else we can put in to liven up the bed - it's the first thing visitors see when they drive in. We've introduced some yellow with the Phlomis Fruticosa and we're thinking of planting bulbs and tulips to provide early season colour. But what about summer? Saturday we were busy planting up the border we'd cleared last weekend. 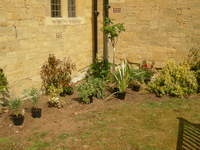 In went : Phlomis Fruticosa (four), Phormium 'Gold Sword (one), Euphorbia Wulfenii (six), Euonymus Fortunei 'Sunshine' (two), Berberis Thunbergii Aurea (two), Callistemon Citrinus (one) and Lonicera Nitida 'Baggesens Gold' (two). 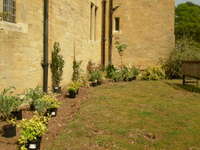 All was well watered in and then covered with eight 80 litre bags of bark mulch to try retain the moisture. 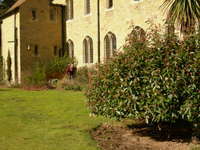 We took advantage of the kind weather last Sunday to get some planting done at the Friary garden. We can only hope to plant things that will do well in a thin sandy soil that gets baked in the sun and attacked by rabbits. 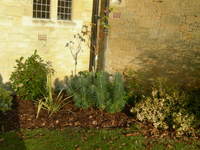 Quite a challenge but we've had success so far with Juniper, Rosemary and Euphorbia. In a couple of hours we got in a Phormium with variegated cream green and wine red tinged leaves next to an established Photinia. For some colour in summer we planted a Magnolia grandiflora 'Victoria' which is evergreen during winter next to some Euonymus fortunei with gold variegation and we hope that the Phlomis fruticosa 'Jerusalem Sage' (not pictured) with its yellow flowers will be rabbit proof. Hopefully we'll get a couple of hours in this weekend to do some more tidying. Then we'll have more time over the Easter weekend to get the bed in order for summer. We got the best of last weekend's weather on Saturday morning. 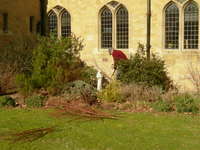 A couple of glorious hours sunshine before the rain set in for the weekend was spent tidying up 'our' border in the monastery garden. We got the bay tree shaped up (and a year's supply of leaves are now drying in the spare room), cut down the Cornus stems (I'll use these as pea sticks) and got a couple of Forsythia under control - now there's a shrub that can defend itself. Maybe I sould have saved the thorny cuttings and spread these over where I've sown my peas to deter the mice. We lightly shaped a Robinia which was getting straggly, shortened a Cotinus or smokebush and left the Callistemon or bottlebrush tree and the Ceanothus to flower before we'll have a go at them. But it's all a bit daunting. Somehow when the border was in full growth last summer there seemed less to do than now when the die back shows up all the little jobs that need doing - patching the landscape fabric here, weeding there, filling that space in, gravel and mulch here..... Guess I know what one of our jobs next weekend will be. Snappy's recent post Healing Earth (read it here) mentioned the work of the charity Thrive. I know first hand what such a superb job they do and if you keep a Christmas charity list then maybe you'll consider donating to them (find out more about Thrive here). At the Friary Fete this summer my wife and I shared our stall with Sue Stuart from Thrive. Sue was selling hanging baskets with plants sourced from Thrive gardening clients (that is how they like to regard their people - not as patients or disabled) and we were selling dried herbs harvested from the monastery garden - bay, rosemary, lavender and sage. We thought branding them Heavenly Scents was just too corny. Next year we are also planning a line of drought resistant hanging baskets, really herb baskets planted with varieties that can best withstand those conditions. 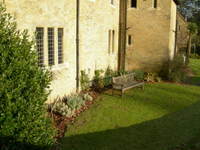 All we need is to source some inexpensive decorative herb pots and Thrive's clients will grow on the plants. Here are some pictures of the Herb Garden (actually full on vegetable production, medicinal herbs and dye plants) gardened by Thrive clients in London. It's survival of the fittest at the moment in the monastery garden. 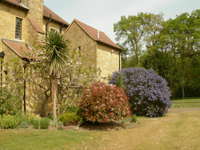 Planting on the baking south facing sandy border has to be heat proof, drought proof, rabbit and deer proof. I suggested a rifle and steady hand to deal with the last two and was met with a chorus of teeth sucking from the Franciscan friars. There is a story going around that these grounds inspired the light orchestral composer Albert Ketelbey 1875-1959 to pen In a Monastery Garden filled with bird song, the peel of bells and the sound of a choir in the distance. There's another story that he was prompted to write it after coming upon a ruined monastery in Yorkshire. Believe what you will, either way it was a chart topper for him in 1915. 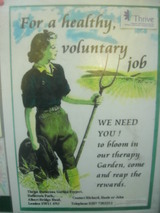 The border needs a 'lift' - a little colour perhaps. Any ideas?